Conrad Maldives Rangali Island announced today the submersion of what is believed to be the world's first undersea residence, which will be completed in the fourth quarter of 2018. The result of a significant $15 million USD investment, this revolutionary concept will transform the Maldives experience for travelers who want to be truly immersed within the natural beauty of the Indian Ocean. As the first international hotel brand to enter the Maldivian market 20 years ago and home to the world's first undersea restaurant, Ithaa, Conrad Maldives Rangali Island continues to pioneer and innovate with the groundbreaking introduction of the undersea residence. Aptly named THE MURAKA or coral in Dhivehi, the local language of the Maldives, the undersea residence gives guests an intimate and immersive experience of one of the Earth's most breathtaking marine environments. Muraka is designed to blend into its environment, giving guests' unparalleled views of the Indian Ocean at every turn. With vibrant colors and a diverse array of marine life all around, Muraka's residents will be able to sleep alongside the wonders of the abundant and colorful marine life that inhabit the sea. "Driven by our inspiration to deliver innovative and transformative experiences to our global travelers, the world's first undersea residence encourages guests to explore the Maldives from an entirely new perspective below the surface of the sea," said Ahmed Saleem, a Director at Crown Company and chief architect and designer of the undersea residence. "THE MURAKA marks our second venture in underwater architecture and technology, next to Ithaa Undersea Restaurant, which is celebrating its 13th anniversary this month. Through our rich history of being a trailblazer in innovative luxury hospitality, we are proud to remain at the forefront of cutting-edge design, technology and architecture." Envisioned by Crown Company Director Ahmed Saleem, and realized by Mike Murphy, leading engineer at M J Murphy Ltd., a New Zealand-based company that specializes in aquarium technology, the undersea residence is a two-level structure comprised of space above the sea level and an undersea suite designed for sleeping under the ocean's surface. The undersea suite features a king size bedroom, living area, bathroom and spiral staircase that leads to the upper level living room. 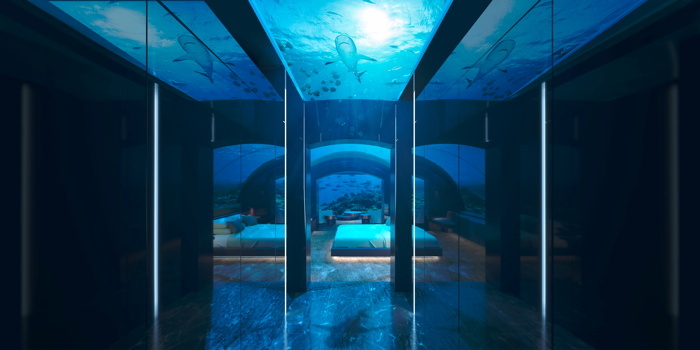 The undersea bedroom floor level sits five meters (16.4 feet) below sea level, providing uninterrupted views of the surrounding marine environment. With the adoption of state-of-the-art technology, Muraka's distinct design is akin to Ithaa's with the curved acrylic dome, which boasts 180-degree panoramic views of the wonders of the Indian Ocean's intricate marine life. Muraka's upper level features a twin-size bedroom, bathroom, powder room, gym, butler's quarters, private security quarters, integrated living room, kitchen, bar and dining, which features a deck that purposely faces the direction of the sunset for optimal viewing pleasure. On the opposite side of the villa sits the relaxation deck that faces the direction of sunrise and is complete with an infinity swimming pool. The upper level also contains an additional king size bedroom and bathroom, which boasts a masterfully appointed ocean-facing bathtub, ideal for soaking in views of the endless horizon. In total, Muraka can accommodate up to nine guests. "Through our development of the world's first undersea residence, we continue to shine a light on the Maldives as a luxury destination as well as a cultural and natural wonder for global travelers," said Stefano Ruzza, General Manager at Conrad Maldives Rangali Island. "We are excited to present Muraka's unique sleeping under the sea experience to our future guests, providing them with an extraordinary seascape of the Maldives from an entirely new perspective." "We are excited to see THE MURAKA bring to life the contemporary design, leading innovation and entrepreneurial spirit that serve as the foundation for the Conrad brand, said Martin Rinck, Global Head, Luxury & Lifestyle Brands, Hilton. "With the development of the world's first undersea residence, Conrad Maldives Rangali Island will offer visitors the opportunity to experience the Maldives like never before." Located in the Maldives' best diving and snorkeling spots, Conrad Maldives Rangali Island has created a space that invites and inspires with a distinctive design that flows harmoniously with the natural environment. The resort features purposefully designed villas and suites, 12 award-winning restaurants and bars, two spas and a selection of culturally inspired experiences set against the awe-inspiring Maldivian surroundings. With the introduction of the world's first undersea residence, Conrad Maldives continues to evolve the diversity of experiences offered to guests. Are you with Conrad Hotels? If you are a member of Conrad Hotels you may be interested in learning how to optimize your content on our network.